Hello all. 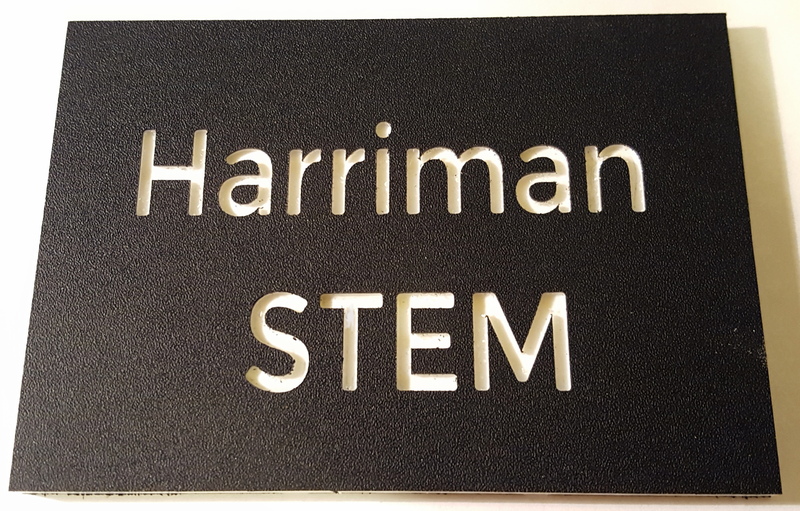 My name is John Daugherty and I teach STEM at Harriman High School in Tennessee. Can't wait to get our Carvey and get started working with it. 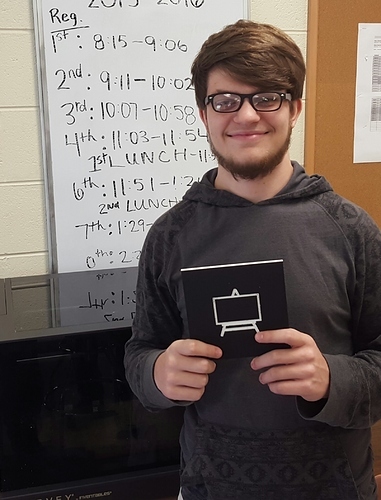 I teach computers and technology at Preston Area School in PA (part of the Wayne Highlands School District). We are a very small rural school. My students are very clever in making things that have a purpose. I have plans to introduce easel to all of my students in the middle school. 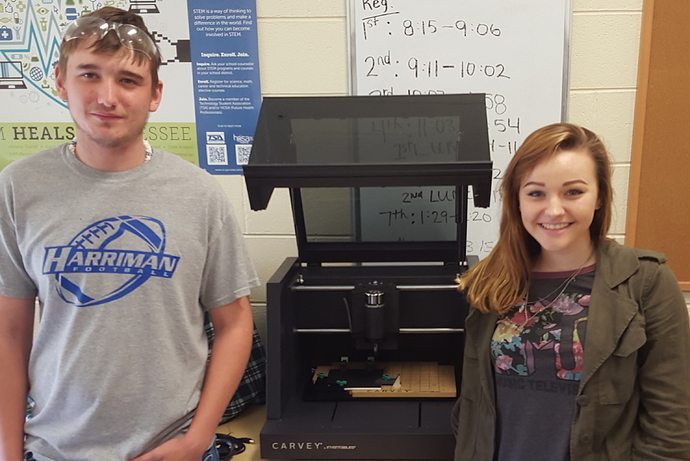 Students will also be using the x-carve in our technology education class next year. I plan on using the machine with several small groups this year and then to spread out projects for the entire middle school next year. I have several projects I have designed in easel and Adobe Illustrator that I want to test out at this point. I was able to bring the svg file in but there is a learning curve in terms of what I needed to do to clean up the svg file generated by illustrator in order to get it to work properly. Once it did it, it was perfect and allowed me to do some things that I couldn't do in easel. A friend who has an x-carve in his school said they use inkscape (free) and have had no issues with svg files. I can't wait to play in more depth. We got our Carvey today! We were all pumped and put it right to work! After the test carve we flipped it over and made a plaque for our door. Can you tell me what material you were using here? It looks awesome. It was the sample piece of HDPE that came with the Carvey as a test piece. Hi everyone. I am having extreme problems with my Carvey. 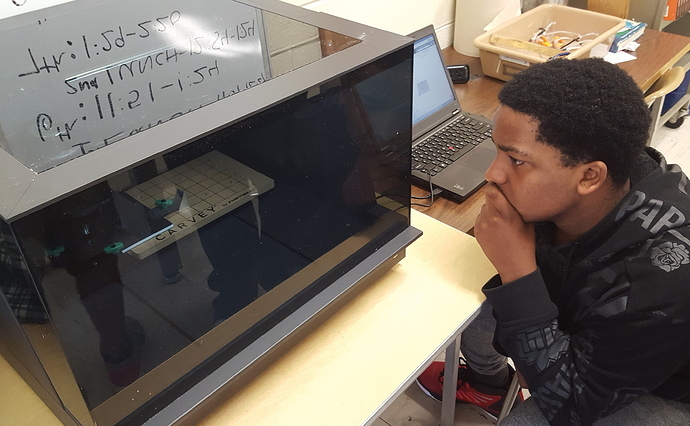 I have been going back and forth with support but I am starting to see that I am not going to be able to get the projects that students started designing done by the end of the year. The Carvey has been making erratic cuts that it is not programmed to make and they are never in the same spot. Anyone else encountered any problems? Sorry to hear you are having troubles! We’ve probably carved >20 ink print 8x11 pieces with no troubles as you are seeing. We have had a couple of problems with the Carvey not finding “Home” but those cleared after turning off and letting it rest for a while. I have seen another problem when we had many Easel tabs open to different designs. Now we try to carve with only one up at a time. Are you creating the images in Easel or importing them in via svg, g-code, image trace… ?? Wondering if that’s where you are picking up artifacts? @CharlesChretien1 do you think we should replace yours with a new one? Do you think it is a defective unit? @Zach_Kaplan I am not sure yet, but it is possible. I have used multiple computers, and multiple projects created in Easel with similar problems. At first I thought it was just a problem in the X-Y direction, but on Friday I saw a problem in the Z direction as well. We were able to carve a handful of things correctly when we got the machine and I was really excited to get this project going in my engineering class to see what they came up with. We started running into problems when we attempting to carve out a piece of 7/8" delrin and something went wrong (that was about 2 weeks ago). I am wondering if that affected something in the machine. I checked the Y axis belt and it looked fine. I was hoping a simple fix or a machine reset was all that was needed but no one has suggested anything along those lines. Support asked me to carve something from Fusion360, but that is a new process for me and may take some time. The problems never seem to occur in the same way twice so it is hard to pinpoint other than to say it is making erratic cuts. Hmmm that is confusing. Can we do a video chat? Sure. I am available on google account at cchretien@mansd.org right now, or later around 10:30. I'm looking to experiment with cutting small circuit boards and soldering on individual components on each board. Idea would be something like circuit stickers but reusable and hopefully lower per unit costs. Students would then use wires to attach components together into circuits. My school budget is tapped so will be paying out of pocket. Are the Inventables Drill/Milling sets and circuit board blanks the way to go? Looking to do some quick/cheap prototypes. Anyone tried milling circuit boards and have suggestions? Hey everyone. I'd love to see an all-in-one resource for less experienced CNCers, and I think it will be extremely valuable especially as more and more of these machines end up is schools. We're all going to have our own spins on how we utilize the machines, but we will all be milling. What are the different bits for? What bit should I use for 'X' material? Feed rates? Spindle speed? Depth per pass? How do I add contrast to this wood carving? How do I finish/protect this type of wood? @Zach_Kaplan From the Inventables side, it'd be great if that information could be found on product pages. The project ideas/examples are great, but there is a lot of variation in the info the creators provide. I want my students' creativity to be the limiting factor in what we make, not the fact that we use the wrong bit or have no idea how to finish bamboo. @NeilFerreri that's our goal too! I'll share a preview of the curriculum here before we go live with it. @Zach_Kaplan Figured you guys would have that going already...can't wait to see what you put together! Thanks.